In the ActivClassroom, nothing is static—subjects, lessons and especially participants and participation fully come alive. And while students enjoy interacting by coming to the ActivBoard, teachers also want connection and freedom of movement—teaching from student desks, debating from the four corners of the room, directing the lesson from inside group discussions. ActivSlate makes dynamic, Interactive classroom experiences everyday occurrences by giving anyone who wishes to participate control of the ActivBoard from anywhere in the ActivClassroom. A wireless, fully integrated, notebook-sized tablet, ActivSlate uses the same ActivPens as our ActivBoard, is small enough to sit on a student desk, and is light enough to be carried into the heart of any discussion. The ActivClassroom supports as many as 16 ActivSlates, but gives teachers the last word with regard to control. Only one ActivSlate can be used at a time—instructors choose who has the floor and who waits patiently for their turn by activating and deactivating slates at will. The ActivSlate 50 enables users to move around the room to teach, controlling the lesson from anywhere in the classroom – making any learning environment versatile. Teachers can move about and connect with students, and everyone can gather and participate. It is also enables students to fully interact without moving from their seats. The intuitive sleep mode and easy recharge also make this an efficient mobile tool for the classroom. All ActivBoards; also works with 3rd-party Interactive whiteboards. Note: Does not require a whiteboard to function. Installation Operation and setup of the ActivSlate 50 requires ActivInspire Personal or Professional Edition software and ActivHub. Specifi cations and access for ActivInspire are located on Promethean Planet at www.Prometheanplanet.com/ActivInspire. User with administrator/privileged access rights required for software installation. What is the ActivSlate 50? The Promethean ActivSlate 50 is a wireless, fully integrated, mini-board; small enough to sit on your desk or to move around the classroom. It operates using the ActivPen, with the same precision as on the ActivBoard. Educational specialists tell us that students are interacting more, not just with the ActivBoard, but also with their teacher and with each other. Some teachers want interaction with children sitting at their desk as well as at the whiteboard. Other teachers want to be able to control the board from anywhere in the classroom. The Activslate meets the needs of teachers and students alike. How does the ActivSlate 50 work? 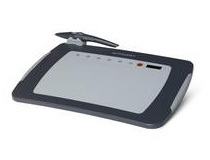 The ActivSlate is wireless and communicates with the ActivHub inserted into an open USB port on a personal computer utilizing 2.4 GHz radio frequency and technology Promethean calls ActivAir™. ActivSlates are registered and turned on and off through the use of either ActivStudio, ActivPrimary or ActivInspire software. Because of the ActivAir™ technology, you can now use up to 16 Activslates in the classroom and the range or distance is up to 100 meters or 328 feet (free space). What are the benefits of the ActivSlate 50? An integrated component of the ActivClassroom, the ActivSlate allows for effective student engagement during a lesson. The ActivSlate provides additional ways for students to participate in the lesson from their desks, and is especially useful with kinesthetic learners (students who learn by touch). However, without any built-in control, these types of devices could be difficult to manage. With the ActivSlate, teachers have built-in classroom management, as they can turn slates on or off using the Activslate controller that is incorporated into ActivInspire.